Minor progress on a sock this weekend, and not much else, though I did finish the Left Mitten and worked out more of the pattern details. It's very sad because my only goal for the entire two days was Finish The Right Mitten and I had so many other things on my plate I barely made it past the thumb. Maybe today. I know everybody who knits socks has probably used these tube things forever but I'd never seen them before I went to KnitPicks for needles and tossed one into my shopping cart. Technically it's to keep double pointed needles from jabbing you or slipping out of the stitches or getting lost in transit, but I love how it removes all the rest of the gear from the equation and draws attention to how much work you've done. I'm such a product knitter. 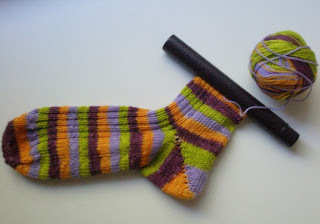 I just now realized that you did a short-row heel on your very first sock. I stand in awe! You are a brave and amazing knitter. Oh dear, was that why I had so much trouble with the instructions? It did make a lot of sense once I realized what all the extra yarn overs were for. And here I thought it was choosing Toe Up that was brave!